California’s modern-day Luddites don’t commit acts of violence against Google, Uber, Amazon and other firms that have shaken up the existing economic order. No one is toasting cellphones in bonfires or sabotaging Federal Express delivery vans, but these New Luddites have used the courts and the legislative process to throw that figurative wrench in the machine. Indeed, the biggest redoubt of Luddite-ism appears to be the California Supreme Court, which in April issued a ruling that has threatened to grind California’s high-tech economy to a halt. The case centered around a package-delivery firm, Dynamex Operations West, which turned its full-time staff into contractors. Obviously, when companies use contractors they need not pay them benefits and are not subject to hourly work rules, wage requirements and the host of labor regulations the state applies to permanent workers. The court tossed out the old, flexible way of determining whether a worker is a contractor or employee and imposed a strict new “ABC Test” for deciding such matters. Under the new standard, California firms that want to classify their workers as contractors must meet all of these terms: The worker is outside the control of the employer for the work performed; the worker performs work that is outside the company’s normal scope, such as a freelancer who does public relations for a tech firm; and the worker is engaged in an independent business enterprise, perhaps having his or her own LLC. One need not be a labor-law expert to realize how this threatens many burgeoning new business models including Transportation Network Companies such as Uber to old-line industries such as Realtors and hairdressers. Growing economies are dynamic. There’s no way to lock anyone’s job into place (outside of government work). One of California’s long-standing problems—a key reason for its sky-high poverty rates—is that its labor regulations read like something from the Industrial Revolution. The state imposes burdensome regulations regarding everything from work breaks to overtime. That might be fine on the factory floor, but the rules stifle innovation—and make it far tougher for companies to survive. These union-backed rules also raise the bar so high that many startups can’t get off the ground, which deprives consumers and workers of exciting new opportunities. The obvious work around has been to use contractors. It’s not just a boon for businesses. Most of the nearly 2 million Californians who are independent contractors prefer to make their own schedules rather than show up 9-5 at the office. Ask your Uber driver, Realtor or barber. The Department of Labor found that 79 percent of contractors prefer these working arrangements with fewer than 9 percent preferring traditional employment. The state’s business community has called on the Legislature and governor to address the problems created by the state high court. Gov. Jerry Brown punted. Incoming Gov. Gavin Newsom has deep ties to the tech community, but one of his top aides is from the California Labor Federation. Unions already are backing a bill to codify Dynamex. This is shaping up as one of the biggest battles in the new session. Will the California government let its ballyhooed New Economy thrive, or will it embrace an approach that was last relevant in the 1800s? Don’t believe it. Facebook is already in the censorship business. In an article published last month titled, “How Facebook Policy Hinders Political Speech,” Ruth Papazian explained in excruciating detail just how difficult it has become to place political ads on Facebook. What this monopolistic communications behemoth has done to the abilities of grassroots groups to spread their messages far and wide cannot be understated. Facebook selectively has disabled the most effective means of grassroots organizing ever devised. The timing of the move, a few months before one of the most pivotal midterm elections in American history, denies every small neighborhood group and individual activist the capacity to quickly tailor the content of their ads to local voters. Large, lavishly funded, well-established campaigns, however, are relatively unaffected by Facebook’s new policy. They have the money, connections, and expertise to treat this new policy as a speedbump. And, of course, it isn’t just Facebook. With growing assertiveness, an assortment of mega-corporations that, for all practical purposes, control virtually all online communications in America, some of them the largest companies on earth, are making a concerted effort to influence the 2018 elections. And their ambitions reach far beyond this November. These corporations have left-leaning employees and left-leaning top management. They wield an ability not only to suppress viewpoints with which they don’t agree and promote viewpoints with which they do agree, but they can also use search results and proprietary search content to shape behaviors and values dramatically. To present an embarrassingly obvious example of how Big Tech is rewriting history, take a look at the result that comes up on Google if you search under the term “American Inventors.” You will see portrait images of fifty individuals who are, according to Google, the top inventors in American history. There are 21 black men, 11 black women, and 18 white men. Curiously, no white women are included on the list. This blatant distortion of historical reality matters more than might readily be apparent. First, it is part of a pervasive pattern whereby the left-wingers who control high-tech companies are rewriting history. But it is more pernicious in its consequences than just that. How will a 10-year-old African-American view his role in society, if he believes that two out of three of the most significant American inventions came from the minds of brilliant African Americans but that these contributions deliberately have been neglected? Won’t that be evidence to support the leftist assertion that racism, and only racism, account for lack of prominent mention for blacks in American history? If this were an isolated example, it would not matter. But it is emblematic of how Big Tech is controlling not only who can communicate and what we can see, but how we view ourselves, our society, and our origins. When we say “Big Tech,” that’s no exaggeration. The table below presents the financial power of some of the primary players controlling how we learn and communicate. The data on this table makes obvious that behind the monopolies or near monopolies these companies wield in data search, social networks, videos, online retail including books, movies, and music, smartphones, and web browsers, there is almost unimaginable financial power. 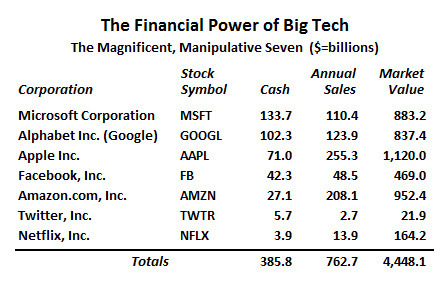 These seven companies together are sitting on $385 billion in cash. Think about this. The smallest of the seven, Twitter, has nearly $4 billion sitting in its checking account. The pieces are in place for these companies, if not literally to take over the world, then at least to play a crucial role, if not the crucial role, in shaping what kind of world we leave to the next generation. For all practical purposes, they have monopolistic control over how we learn and communicate. And they have more discretionary cash than any other private interest, anywhere. The tools of influence they wield are only beginning to be developed. To explore the dystopian potential of these dawning technologies, you don’t have to rely on conservative analysts. Arguments aplenty can be found in the liberal media; you would think they’d connect the dots and recognize what could happen if and when Big Tech is no longer controlled by liberals. Think about it. Your Fitbit, always connected, monitors how you react as you click on various links online. This means that not only your clicks but your simultaneous physical reaction to what you are seeing are monitored and compiled. Eventually, the machines know you better than you know yourself. Your brain has been hacked. Dr. Pavlov, meet Brave New World. Patriots, you may or may not have reason to be paranoid, but in any case, don’t rely on your AR-15s to preserve your liberty. Start a hacker collective. The “smart cloud” is coming. You can’t shoot down a swarm of bees. Then again, you may not care. Call up Google’s “satellite view” of the vast savannas of Africa or the steppes of Asia—are they summer brown or spring green? A vastly differing impression is created. And how green is the green? Are the watered areas of earth verdant and lustrous with life, or tepidly broaching a bit of tentative foliage wilting on a warming world? What about snowpacks and glaciers? What view? Winter or summer? When it comes to political geography, Google is an international actor with enormous influence. It’s a tough job, drawing borders on a map when everyone on earth uses your map. According to Google, the city of Srinagar is no longer part of Indian Kashmir. Instead, it’s in a region with dotted borders indicating uncertain sovereignty. Similarly, the entire northeastern portion of Kashmir is lopped off, with dotted lines again, indicating that this area may actually be part of China. A province in the extreme northeast of India, Arunachal Pradesh, now has a dotted line drawn through its middle, questioning whether the northern half of that province belongs to India or to China. Ditto for the eastern border of Tajikistan, where Google’s dotted line asserts that nobody knows where Tajikistan ends and China begins. But among Google’s mapmakers, who decides? Where’s Tibet? Why no dotted line to delineate that occupied land? While Google ignores Tibetan claims to nationhood, they recognize every indigenous tribe in North America. Observe the United States. When the lower 48 fills about half your screen, you’ll see the names of each state. Zoom in one notch. Suddenly the Navajo, Blackfeet, Crow, Yakima, Cheyenne and dozens of other tribes all have nations—reservations with borders and place names written in faint but capitalized fonts larger than those used for names of major cities. Same thing for Canada and South America. Even if Google’s mapmakers didn’t have an agenda, millions of people would disagree with their choices. But billions more would accept the lines they draw, solid and dotted alike, as truth. The manner in which Google arbitrates international borders constitutes real power. Google controls 92 percent of the global mapping and GIS market. The company also controls more than 90 percent of the global internet searchmarket, and through YouTube, it controls 79 percent of multimedia websites and video portals worldwide. And Google has more than $100 billion in its checking account. That the founders and the employees of big tech companies are overwhelmingly Democrats should by now be beyond serious debate. And evidence mounts that these biases inform how they write their algorithms. There’s nothing objective about an algorithm—it may process every query with complete impartiality, but built into the logic and lookup tables are the preferences and priorities of a human being. One widely reported study claims that biased search results can influence elections in close races. The study, authored in 2015 by Robert Epstein and Ronald E. Robertson and published in the journal of the National Academy of Sciences, reached four conclusions regarding search engines and search engine manipulation: First, they identify a positive feedback loop, whereby when search rankings affect voter preferences, those voters then search on terms that are, for example, favorable towards a particular candidate. This results in those favorable search results receiving more clicks which in-turn causes them to be ranked higher still, generating more views and clicks, and so on. Second, search engine manipulation is very hard to detect, leading those influenced by it to believe they have formed their new opinions voluntarily. Third, unlike explicit campaigning, where candidates have equal access to conventional means of voter outreach, search engine manipulation occurs at the discretion of the company that owns the search engine, leaving out-of-favor candidates with no means to counter its effects. Fourth, conventional means of voter outreach continue to lose effectiveness relative to the impact of online resources such as search engines. The elephant in the room here is Google, and even if that company isn’t directing its programmers to introduce liberal bias into their search results, the culture within Google suggests their programmers would be doing it anyway. After all, this is the company that fired James Damore for circulating an internal memo that committed the heresy of arguing that disparities in group achievement might be due to something other than racism and sexism. This is the company where, in a leaked email, their former head of “multicultural marketing” described efforts she led on behalf of the company to increase Latino turnout in the 2016 election and bemoaned the fact that not enough of them voted for Democrats. This is the company where 90 percent of reported political donations by executives and employees went to Democrats in the period between 2004 and 2016; over $15 million. And it isn’t just Google, of course. Twitter “shadowbans.” Facebook suppresses conservative commentators. YouTube restricts conservative videos. Apple bans “controversial” programs from its App Store. Can Amazon and other eBook purveyors even rewrite classic literature? Well, why not? The tactics these companies employ are difficult to detect and nearly impossible to counter. Increasingly, this handful of mega-corporations have the power to rewrite history, to determine who is permitted to have a public voice, and to decide what is a fact and what is not a fact. And it extends to nearly every facet of life, not just election manipulation, but the foundations of Western Civilization; culture, race, gender, patriarchy, nationalism, patriotism, meritocracy, underachievement, even the reasons for climate change. As Big Tech arbitrates the premises of reality, facts, according to their own beliefs and biases, a complicit media follows suit. For example, the BBC recently updated their guidelines for future reporting on climate change issues. Suddenly certain conclusions are no longer heard. But facts are based on data. And data can often be analyzed and interpreted, with integrity, to yield diametrically opposed conclusions. “Facts” are often opinions. This skepticism used to be the lifeblood of both science and journalism, but skepticism is only selectively encouraged anymore. Big Tech is narrowing that range when it ought to be expanding it. Stare into the glass. The mesmerizing blue light. Click. Click again. Let the dopamine flow. Some of them, the big ones, will intrude the old fashioned way, beating down the door. Maybe others will look like insects, crawling innocuously across your property to come inside through your drains and A/C ducts. Or they’ll find an open window. Across America, they’ll come by the millions, having manufactured themselves. They’ll be several generations smarter than the smartest smart phone in existence today. They’ll know everything about you, and at 4:30 a.m., on a hot night in late June, all at once they’ll come for you and everyone like you. Some of you will die, deemed to dangerous to live, but most of you will just be humanely incapacitated. Against all this technology, your AR 15 rifles are pathetically inadequate. Remember that. When it comes to protecting yourself from a tyrannical government, your guns are obsolete. This may be a hypothetical scenario, but it isn’t a fantasy. It’s less than a decade from being technically feasible, if it isn’t already. So what, right? We want to be safe. We’re not doing anything wrong. Hold that thought. Let’s continue. Do you use the internet? Of course you do. This means the government is able to (1) monitor your phone records, (2) mandate ISPs to turn over records of your online activity, (3) hack your mobile and wireless devices, (4) utilize “back doors” into your encrypted apps, (5) track your location at any time via your cell phone, (6) tap into any internet line, (7) monitor all your financial transactions, and (8) read your email. Big deal. My life is boring. Have a look. Knock yourself out. I don’t care. Ok, here are a few more reminders of just how far big tech has intruded into our lives. And then there are our new and omnipresent digital helpmates, Siri, Alexa, Google Assistant, and all the rest of those devices who talk to you and listen to you. It’s all wondrous. Bring it on. The fun has just begun. Wait till the androids arrive; we’ll marry them, give them rights, let them vote and own property. Because they aren’t going to be remotely monitored, and they won’t adhere to programs written by human beings with an agenda. Of course not. Relax. But someday soon, try to tell an atheist who married his android that it’s just a toaster, and that apart from big brother watching from afar, nobody’s home inside. If you think the millions are brainwashed today, imagine tomorrow. Which brings us to the big tech giants who have created near monopolies on how we communicate online, how we learn, how our opinions are shaped, and what we believe in. We have seen how, in order to influence elections and mass political sentiments, Google manipulates search results, Facebook meticulously curates fantastically detailed profiles of its billions of users at the same time as it suppresses politically incorrect views, YouTube selectively demonetizes or restricts videos, and Twitter “shadowbans.” And we know they coordinate their efforts. Where’s this headed? If you want to know where high technology is taking us, go to the Silicon Valley, in sunny California. In this epicenter of high tech, Santa Clara County, 45% of working age residents (25-45) are foreign born. These foreigners tend to be either wealthy, highly educated Asians who own and work in high tech companies, or relatively poor, uneducated Latin Americans who do menial service jobs. That dichotomy is reflected in the price of housing, bid upwards by Asian immigrants who bring with them suitcases full of cash, and the poverty rate, pushed up by hard working, low wage Latino immigrants who can’t afford the cost of living. Santa Clara’s median home price is $925,000 and the poverty rate is 9.4%. But how are these demographics represented in Silicon Valley’s politics? The White liberal elite, who love to hire Asian programmers on H-1 visas (thousands of whom are foreign agents), and love to hire Mexicans and Central Americans to cook, clean, landscape, and drive down wages for service workers across the board, have concocted a winning political message. It is cynical and dishonest, but devastatingly effective. They posture and bellow as loud and as often as they can how much they care about “people of color” and “diversity,” at the same time as they enact draconian restrictions on land development, conventional energy use, or any sort of infrastructure investment that might actually help lower the cost of living. For them, it doesn’t matter. They’re rich. And now they have Donald Trump, the most convenient boogeyman in the history of American liberalism. One recent and very representative expression of the liberal arrogance that informs the Silicon Valley elite is an influential article written early in 2018 by Peter Leyden, a journalist and entrepreneur who calls Silicon Valley home. Entitled “The Great Lesson of California in America’s New Civil War,” the article claims “there’s no bipartisan way forward at this juncture in our history — one side must win.” Perhaps, sadly, that is the only thing in this frighteningly arrogant manifesto where everyone might find agreement. Leyden’s partisan certainty is only matched by his astounding failure to recognize the cold reality of his state’s supposedly enlightened policies. He writes “Since 1980, their [Republican] policies have engorged the rich while flatlining the incomes of the majority of Americans. But California has the fourth highest rate of income inequality in the U.S., eclipsed among major states only by the equally Democrat-controlled New York. Leyden is invited to take a walk through the barrio in East San Jose, or the ‘hood up in San Francisco’s Hunters Point. He should ask the residents how they feel they’re being served by the politicians running California. He should ask them how they like watching millions of wealthy Asian immigrants buy up all the homes and drive up the prices, while poor Latino immigrant workers drive down all the wages. When it comes to “climate change,” Leyden’s pronouncements are also representative of California’s liberal elite. In between his despicable use of the term “Deniers,” which equates climate skeptics with holocaust deniers, Leyden writes “California is leading the world in technological innovation and creative policies to counter climate change.” But what if Leyden and all his alarmist cohorts are dead wrong? What if the debate over climate change should not be silenced? Because what if including clean fossil fuel and safe nuclear power is the only possible way humanity can rapidly and effectively empower aspiring billions of people in the developing world, delivering the energy-driven prosperity to their cultures that is absolutely correlated to lower birthrates? What if renewable power is actually less sustainable? More immediately, what if creating this artificial scarcity of energy is making it impossible for low-income Californians to pay their bills? But the elite don’t care about that. They’re rich. By the way, try to search for balanced material on clean energy on Google – you pretty much can’t find it. And if you can still find robust links to credible information produced by climate contrarians on your Facebook feeds, know that you are only seeing them because Facebook has put you into a “silo.” Those with online activity patterns that indicate they aren’t already receptive to climate contrarianism will NOT see those links. They won’t know. They will view monolithically packaged information spreading one message – the debate is over, fossil fuel and nuclear power are bad for humanity and the earth. Case closed. Ditto for every other important, politically incorrect premise of conservatism. There’s nothing wrong with some immigration; there’s nothing wrong with investing in renewable energy. But to brand the skeptics as “racists” and “deniers,” and to suppress their arguments in the electronic public square – that is where the Silicon Valley abuses their power. And it has just begun. The problem here, of course, is that we “deplorables” don’t want to be “thoroughly defeated.” We don’t want to live in a nation where we can’t afford homes, we can’t find good jobs, we can’t afford heating or cooling, and our transgressions are perpetually monitored inside and outside our rented apartments. We don’t want to live in “smart growth” communities where the only places we can afford to live are in high rises and the only transportation we can afford to use are trains and buses. We don’t want our culture destroyed by mass immigration nor do we want our economic ambitions crushed by unfair trade and punitive environmental mandates. We don’t like what the Democrats have done to California. We’re not going to accept their way of life. Silicon Valley is the origin of modern high technology. It has offered innovations, most of them desirable if not the stuff of dreams. It is transforming the world. But it is easy to imagine how so much power can be misused. And Silicon Valley today is controlled by leftists. These high-tech titans form the most powerful group in a leftist coalition that includes academia, entertainment, mainstream media, and the HR departments in every major corporation in America. If you don’t think this coalition is powerful enough to take over the federal government and turn America into California, you’re dreaming. Which brings us back to the Night of the Slap Drones. Back in June, 1934, another virulent pack of leftist utopian fascists decided that the “side resisting change” had to be “thoroughly defeated.” Within hours, on this “Night of the Long Knives,” hundreds of people identified as the resistance were silenced forever – shot in their beds at 4:30 in the morning, or arrested and hung within days. And if it happens this time, it won’t be knives and guns that do the killing. It will be robots and drones, controlled by the left-wing oligarchs and their minions of “anti-fascist” true believers, the elite of the Silicon Valley. Stop them now. Because if and when they take power, resistance will be futile. Ed Ring is a fifth-generation Californian with more than 20 years experience in business and politics, primarily with start-up and early-stage organizations. He is a prolific writer on the topics of political reform and sustainable economic development. Ring has an undergraduate degree in political science from UC Davis, and an MBA in finance from the University of Southern California. California could soon be the first U.S. state to impose a “robot tax” to mitigate the economic effects of the replacement of factory workers by machines — if one San Francisco Democrat gets her way. San Francisco supervisor Jane Kim, who Wednesday launched a campaign called the Jobs of the Future Fund to study a statewide “payroll” tax on job-stealing machines. Proceeds from the tax would bankroll things like job retraining, free community college, or perhaps a universal basic income―countermeasures Kim thinks might make a robotic future more bearable for humans. The idea is being discussed in industrialized countries the world over, as Artificial Intelligence (AI) is beginning to outpace human development in the workplace. According to Swiss Info, an online European business publication, the idea is gaining traction across the globe: “South Korea this month introduced the world’s first tax on robots amid fears that machines would replace human workers. The country will limit tax incentives for investments in automated machines as part of a newly proposed revision of its tax laws.” The report notes that the European Union is also looking at the issue. YCombinator start-up guru Sam Altman has been experimenting with the idea of a universal income grant to offset displacement caused by AI. The idea has spread throughout Silicon Valley and is beginning to take root across the country, according to Bloomberg News. Kim is not ready to push Sacramento for a new law yet. For now, she’s pushing for an open dialogue with all stakeholders including business owners, tech experts, as well as government and union leaders. A federal judge has thrown out a proposed $100 million settlement negotiated by a Boston lawyer on behalf of more than 200,000 Uber drivers in California and Massachusetts, saying it places too low a value on potentially costly claims drivers could bring under California labor laws. U.S. District Judge Edward Chen, who has consistently ruled in favor of attorney Shannon Liss-Riordan over Uber’s fierce objections, rejected the settlement because it allocated only $1 million for claims under California’s Private Attorneys General Act, a law that allows employees to sue for civil penalties on behalf of the state. The California Labor and Workforce Development Agency estimated the value of those claims to be $1 billion if a court determined Uber drivers were employees and not independent contractors, as Uber maintains. A week ago, Zocalo Public Square published an article, Imagining California Without Oil Refineries, by one of its editors, Lisa Margonelli, suggesting that Californians are embracing new technology that will lead to an oil free future. She wrote that not being gasoline consumers has become part of many Californians’ identities. Meanwhile, the California Resources Corporation (CRC), a publicly traded oil and natural gas exploration and production company, produced a website also asking Californians to imagine the state without oil. The two imaginings could not have been more apart. The Zocalo piece spoke of the history of the environmental movement in the Golden State and the fact that younger generations are limiting consumerism and supporting a new way of living that reduces — and some day would eliminate — the need for oil. The CRC imagined a day without oil and offered a list of products that would disappear. Never mind the energy that is used to power products, petroleum is raw material used in refrigerators, dishes, smartphones, coffee makers, kayaks and more. But it was the area of economic effects that made me take notice. But accepting for the moment that there would be a rush of new jobs with technology and alternative energy what might be lost if we shut down the oil business? The industry directly employs 184,100 Californians from diverse backgrounds and all levels of the socio-economic spectrum, which translates into $23.3 billion per year in wages and salaries for oil and natural gas jobs. It offers jobs to workers of all education levels, including truck drivers, geophysicists, chemists and machinists. The oil and natural gas sector reflects California’s diversity. Over a quarter of the statewide industry workforce is Latino … In California, the average annual oil and natural gas industry salary of $118,032 is double the $56,590 average for other private industry jobs, according to a 2015 report by the Los Angeles Economic Development Corporation (LAEDC). In total labor income alone, the oil industry injected $40 billion annually into the state’s economy, according to the LAEDC report. These salaries filter into the local economy through the vendors who work with the oil companies and the local businesses frequented by workers… The oil industry supported 456,000 jobs in the state, or 2.1 percent of California’s employment, and generated more than $204 billion in direct economic activity. In addition, U.S. oil and natural gas companies pay considerably more in taxes than the average manufacturing company. According to Standard & Poor’s research, in 2013 the oil and natural gas industry paid an average effective tax rate of 40.2 percent versus 22.3 percent for other S&P 500 industries such as healthcare, retail, utilities, media and pharma. In California, nearly $22 billion in state and local taxes collected in 2013 can be attributed to the oil industry, as well as $14.8 billion in sales and excise taxes, according to the LAEDC report, all of which help fund essential services and infrastructure that Californians rely on every day. The issue of taxes paid by oil and gas companies plays against the future imagined in the Zocalo piece. Will the new alternative energy industries produce the same kind of revenue for the state? You wonder if we cut out the traditional energy industries with all those jobs and the billions paid by the oil and gas industry in taxes if there will be revenue available to offer generous state funded incentives to buy solar panels and electric vehicles or pay for other budget items. 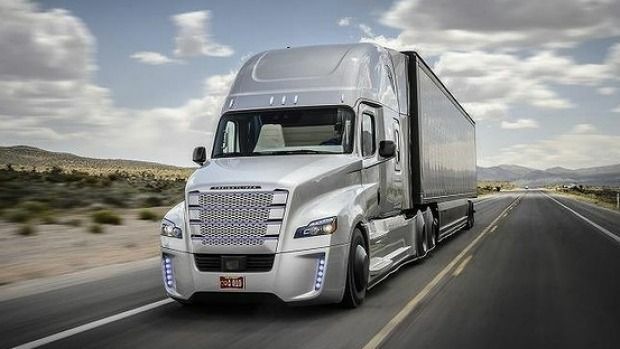 In a Las Vegas press conference, Daimler board member Wolfgang Bernhard depicted the trucks as a step ahead of self-driving cars in safety, desirability and economic impact. But Bernhard conceded that the trucks wouldn’t hit commercial viability until “enough U.S. states allow them on their roads to make inter-state commerce viable,” as Reuters summarized his remarks. With remarkable speed, California’s top technologists have reached a breakthrough point in their development of automated cars. Automated vehicles from seven companies have hit Golden State freeways, with more to come. Although Delphi has focused on achieving automated travel by applying technology to cars made elsewhere, Google and Tesla have reached an advanced stage in automated cars constructed with their own software and hardware. The firms have concentrated on two basic types of transportation. Some work has centered around “self-driving” technology, wherein the person behind the wheel would not have to operate the car in order for it to drive. Other efforts have pursued “driverless” technology. More radical than self-driving, driverless technology would free travelers from having to occupy a driver’s position at all. Tesla chief Elon Musk raised eyebrows with an announcement that went beyond driverless cars. Musk revealed that, this summer, “a software update — not a repair performed by a mechanic — would give Tesla’s Model S sedans the ability to start driving themselves, at least part of the time, in a hands-free mode that the company refers to as autopilot,” the New York Times reported. Translation: Motorists would be able to experience “driverless” personal transportation in cars they already own or have access to. In comments calculated to make headlines, Musk recently opined that, eventually, humans would be prohibited from driving by law for safety’s sake. Evidently well aware of such concerns, Google recently obtained a patent for its driverless car that could see external airbags deployed to protect pedestrians from any unforeseen difficulties.